At the end of November, Andrew Creighton of BC Building Science became an honourary Centra Cares member when he joined a team of 14 to help build a classroom in the remote mountain village of Marbial, Haiti. Check out the Centra Cares blog to read Andrew's take on the trip. 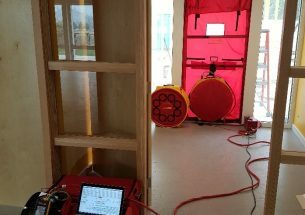 Mohammad Fakoor, PhD, CEA, EIT, one of BC Building Science's Certified Energy Advisors, recently authored a report on the air tightness tests performed at the passive house Okanagan daycare in Penticton. Passive House presented Dr. Fakoor's report at the NAPHN17 conference in Oakland, California. BC Building Science got involved in the Great Canadian Shoreline Cleanup last Friday by spending an afternoon picking up garbage at Sapperton Landing - a park near our office that runs along the Fraser River. David Joyce, EIT, has been a Project Engineer at BC Building Science for the past two years, specializing in New Construction. Last week, we rolled up our sleeves to participate in a blood drive for the Canadian Blood Services. Despite most of the participants being first-time donors, everyone managed to overcome their nervousness and successfully donate. As part of our professional development program, some of us attended a workshop at Kryton's Vancouver plant. 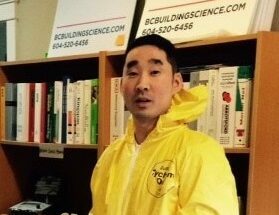 We learned about Kryton’s cementitious waterproofing and leak repair products, like rapid-setting hydraulic cement, grouts, waterstops, and surface waterproofing. We were able to mix and apply some of the products too, giving us a new appreciation for the materials that we specify and the contractors that have to install them. Executive Group Development's Epic at West has some stunning views of the city, and we get to enjoy them while we work! Learn more about this new False Creek Development here.